We are looking for Women Angels. Are you one of us? WA4STEAM members are eager to invest, learn and grow their knowledge and investment experience in a gregarious fashion, basing its strength and strategy on the group, its dynamics while minimizing individual risk. Members willing to join WA4STEAM must understand and commit to our values and the way we operate. Fill in the Women Angels’ Application. Submit a short bio (maximum 15 lines) explaining the professional profile and potential contribution to the group and the reason to join. WA candidates will be asked to read and accept the Articles of Association, the Operating Rule Book and to sign the pledge in the Adherence Document. 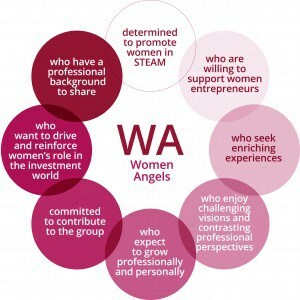 WA candidates must be sponsored by at least two WA4STEAM angels.